Elise and Rajiv’s Caswell House wedding is perfect: elegant styling and classy touches make their day wonderfully pretty and perfect for the 15th century manor house. They make the most gorgeous couple, don’t you think? This is ever so beautiful and I know you’ll love it. Huge thanks to our lovely sponsor Carol Elizabeth Photography and to the stunning bride and groom for their words of wisdom and advice! “We had a holiday theme with an asian twist. All our tables were named after South East Asian Islands and we also had Asian lounge music in the background. The reason for that was because we met in Malaysia and the start of our relationship was spent travelling in different places in South East Asia. Lauren and Aaron’s wedding is so beautiful – and as hydrangeas are in season for most of the summer months, there are some wonderful ideas here for weddings from June through to mid autumn which I think you will LOVE!! Our wedding flowers were hydrangeas. A very talented friend of the groom’s family arranged all the flowers from centre pieces to bridal bouquets. They were absolutely stunning and all fitted perfectly in the wooden boxes made by the father of the bride. 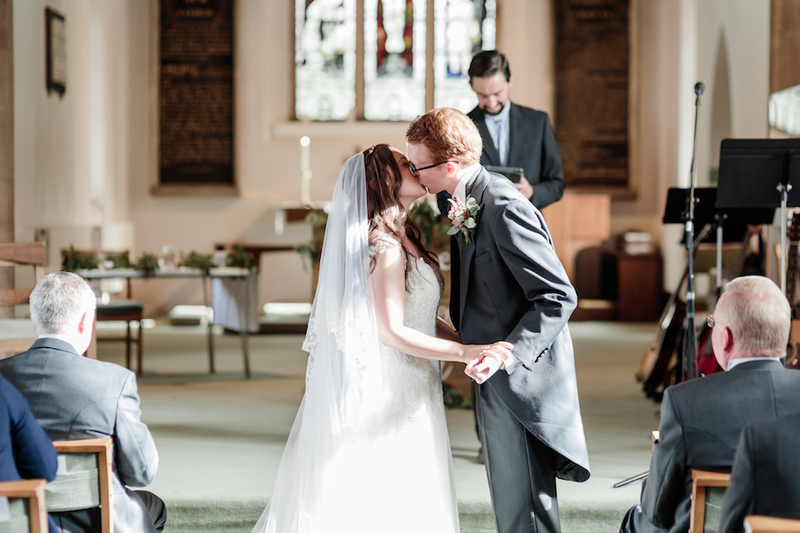 Our wedding was a mixture of a village fete and a 1930s edwardian carnival. It sort of evolved once I had picked the dress and the invites had been designed. The majority of suppliers were recommendations from Facebook, Pinterest and trawling through the internet. We did everything ourselves with the help of friends. The village hall came with lovely old wooden chairs and tressel tables. We put these in the marquee and then added our detail. Our wedding invites were made into place mats and guests were given colouring pencils to show their artistic talents. 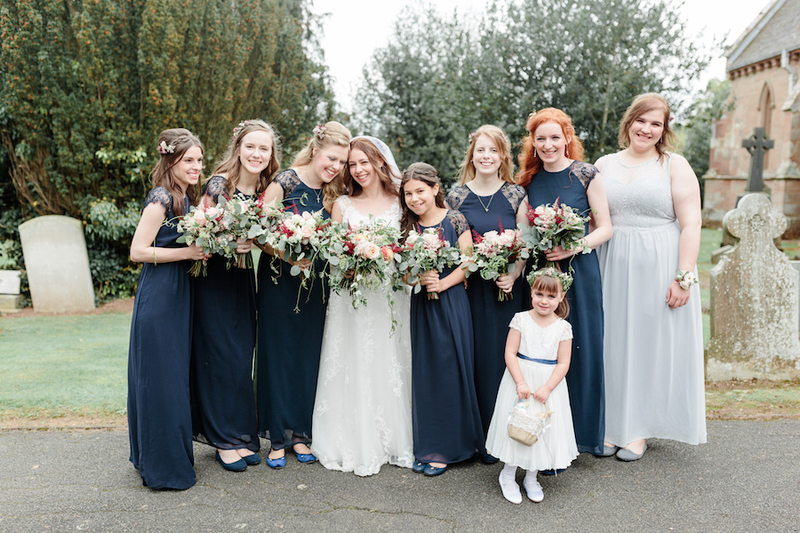 Claire and Nico’s wedding is fabulous – full of pretty homemade touches and all with the help of their wonderful family and friends. The flowers are stunning, the rustic wooden props and accessories look gorgeous! 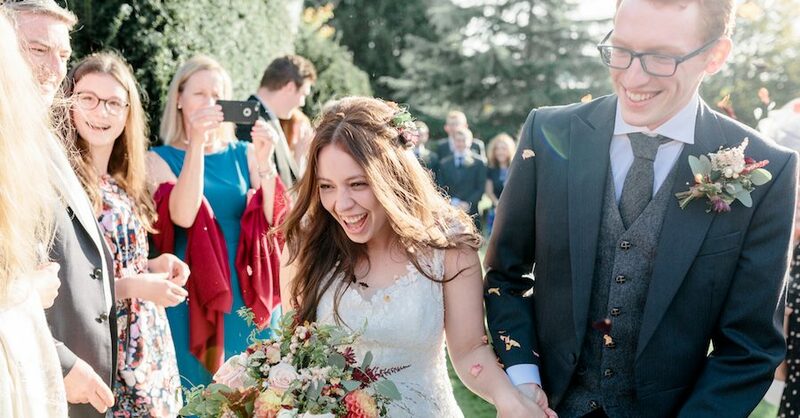 “Our wedding was the happiest day of our lives… totally perfect! I wanted something really chilled and relaxed, nothing too styled or formal. 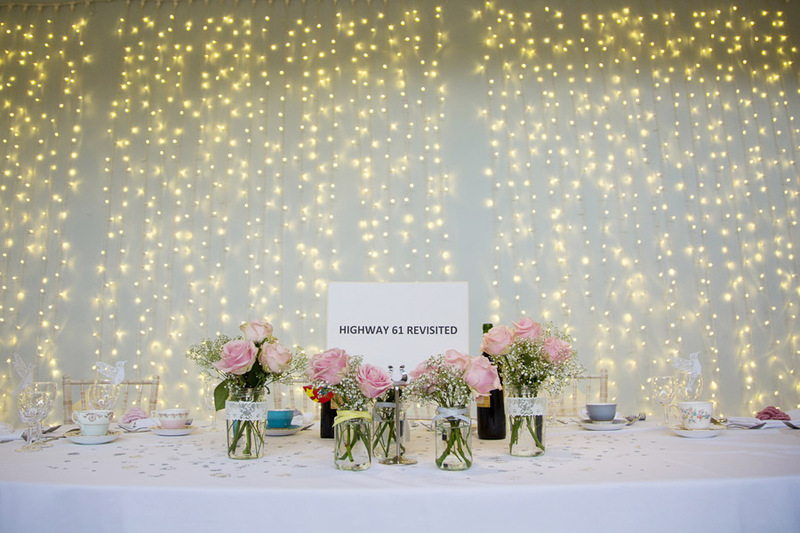 It was very much a homemade affair styled around the English countryside, relaxed, and shabby chic! You’ll fall off your bicycle* when you see today’s real wedding… it’s just incredibly beautiful and fun and unique and individual and all of those things I LOVE about modern English weddings. [and breathe!] There are so many fabulous images of – well – so many amazing things to show you! A vintage wedding dress, a groom with real vintage style, a fabulous venue, weeks worth of wedding DIY projects and so much more. All images are by the fabulous Sophie Duckworth Photography, who is based in Surrey. Sophie is one of my awesome team of wedding blog sponsors and you can read more about her here. *bicycle-riding bride? Check! Samantha is all kinds of amazing! Did anyone watch Derren Brown’s “Fear and Faith” and remember the part where – as if by magic – some of us could smell mint at home? If you were one of the lucky ones who picked up on the minty fragrance, you’ll be delighted to hear English Wedding Blog is doing the same trick today, with lavender wedding ideas. I’ve been looking forward to sharing today’s Cotswold Beauty lavender wedding ideas shoot with you. 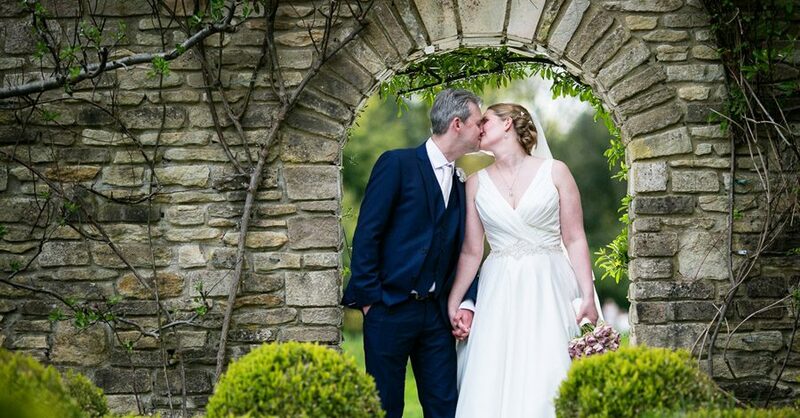 The images are by my wedding photographer friend Jonathon at Photoglow photography in Gloucestershire, who teamed up with Jane from Planned for Perfection and some other fab wedding suppliers to visit Snowshill Lavender Fields last year. The photos are so amazing you can practically smell the lavender, I swear! I love lavender – it helps me sleep and reminds me of my Nana and my Grandma – it’s just one of those fragrances which is timeless and comforting too. What could be more perfect for a wedding day scent? If you’re considering incorporating lavender into your wedding day, you’re going to LOVE this! 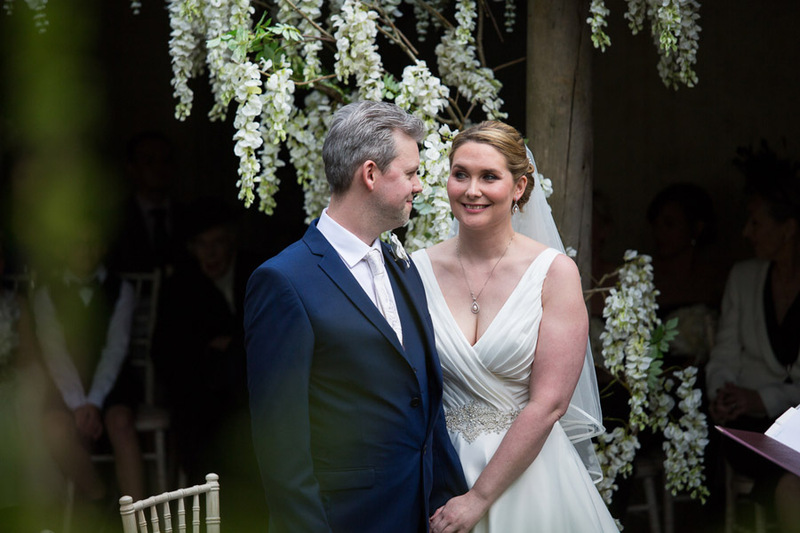 Sean and Rachel had a very personal Cotswolds wedding – a quiet registry office trip followed by the most gorgeous party and perfect ceremony at a private country manor house in the Cotswolds. The family vicar officiated in the afternoon; Rachel and Sean did their own readings and made speeches. They had a high tea for guests in the morning, and the afternoon reception carried on until the early hours! I love this. The styling of the day is wonderfully relaxed, colourful and rustic. The way Sean and Rachel planned their day is inspiring. Their story of the wedding day explains it all – read, enjoy and get inspired by this wonderful Cotswolds wedding. With thanks also to Ruth from Finesse Planning for telling me about the wedding, and to wedding photographer Dafydd Hughes for the beautiful photos. Sean proposed in the gardens just below the Piazza de Michelangelo in Florence, whilst on holiday. Down on one knee, sun setting. It was breath-taking and totally unexpected!